Admissions to the academic session 2016-17 will begin Thursday. Based on the first cut-off list, students can take admission until July 2. After consecutive years of Delhi university cut-offs touching the 100 per cent mark, the highest cut-offs this year witnessed a slight dip, with Ramjas College requiring the highest score of 99.25 per cent for admission into B Com (honours), followed closely by SGTB Khalsa, with a cut-off of 99 per cent for admission into BSc (Honours ) in Electronics. While Ramjas College had a percentage requirement of 97.75 for BCom (Honours) last year, SGTB Khalsa college had pegged their cut-off at 96.33 per cent for BSc in Electronics. Cut-off requirements at Khalsa College for most subjects rose this year — from 96.5 to 98.75 per cent for English honours, 95 to 97.25 per cent for History honours, 96.5 to 98.5 for BCom and a 10 per cent jump, from 85 per cent to 95 per cent, for BA honours in Punjabi. Shri Ram College of Commerce has kept its cut-off for Economics (H) the same as last year at 98.25 per cent, but has raised its B Com (H) cut-off to 98 per cent this year, as compared to 97.37 per cent last year. Lady Shri Ram College (LSR), meanwhile, had similar cut-offs as last year for courses like English Honours (98.25 per cent), Economics Honours (98 per cent) and BCom (Honours) (98 per cent). The cut-off for journalism saw a slight dip, from 98.5 per cent last year to 97.5 per cent this year. Cut-offs in science subjects — such as Mathematics, Physics and Chemistry — continued to remain high at 98.5 per cent, 98.33 per cent and 98.33 per cent, respectively. Even though cut-off requirement in Computer Science did not touch the 100 per cent mark this year, cut-offs remained high in most colleges, with PGDAV college requiring the highest score at 98 per cent for the subject. Cut-offs in Delhi University had hit the 100 per cent mark last year with two colleges – College of Vocational Studies (CVS) and IP College for Women — requiring the perfect score in BSc (Honours) Computer Science. This year, students who want to study the same subject in CVS and IP College need 95 per cent and 97 per cent respectively. English (Honours), which received 1,15,786 applications, the most for any subject, has the highest cut-off requirement of 98.75 per cent in SGTB Khalsa college. Other colleges like LSR, Dyal Singh and Miranda House require 98.25, 98 and 97.5 per cent respectively for the subject. Economics Honours – another sought-after subject – has seen a cut-off requirement of 98.25 per cent – with SRCC, Kalindi and Ramjas College with the same cut-off percentage. 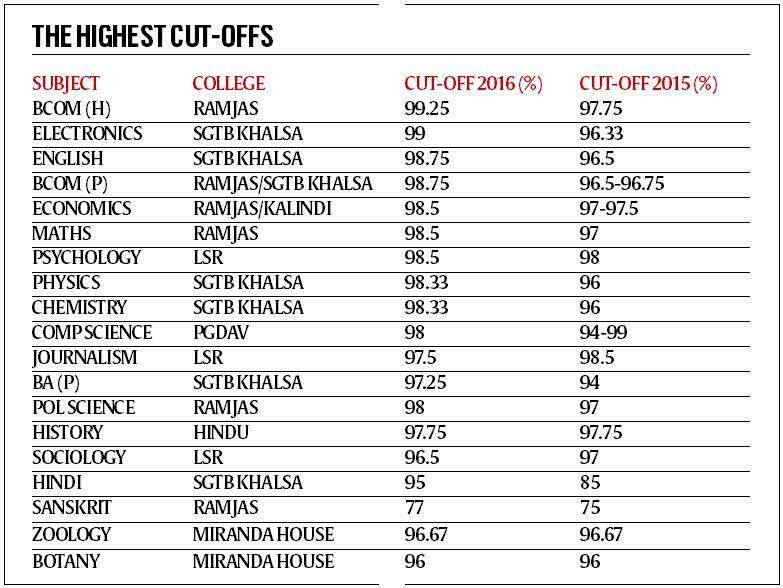 Cut-offs in Psychology (Honours) also remained high, with LSR announcing the highest cut-off at 98.5 per cent. This year, the university will only release five cut-off lists this year. DU will stick to its “best of four” formula while admitting the new batch of students. Admission-seekers can include marks of the subject in which they wish to do Honours and one language subject, along with two other subjects. In a first, the entire admission process took place online, and saw a dip of 14 per cent in the number of applications. While nearly 3.2 lakh people applied for admissions last year, approximately 2.5 lakh have applied to the varsity this year.